The first part of the Paris Grand Prix has finsihed. Alexander Grischuk was white in three games out of four but still didn't manage to win any. Yesterday he faced his main rival Fabiano Caruana. Let us remind you, they both still have a chance to qualify for the Candidates. "My position was hopeless," Caruana said after the game. "I was just lucky. I completely underestimated Alexander's idea 17.с5!" Here Russian could make his initiative even stronger by playing 20.Ndb5! 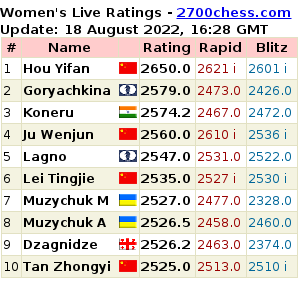 20...c6 21.Na4 Qd8 22.dxc6 bxc6 23.Nd6 Re7 24.Nc5. The phrase we used as a title of course doesn't reflect the compleity of the position: both sides were mistaken at different stages of the game. However, Alexander made four inaccuracies starting from move 39 and as a result his opponent managed to escape. 39.gxh3?! At the press conference GMs agreed that after 39.g3 (or even after 39.g4) the position should have been won for white. 39...Bb6 40.Kf2? Allows the knight to jump on h6. White had to start with 40.R1d3, and reply with 41.Kf2 on 40...Re8. The position stays complex and it's hard for Black to equalize. 40...Nh6! 41.Kf3?! 41.Rd6 Bxe3+ 42.Kxe3 Nf5+ 43.Kf3 Nxd6 44.Rxd6 Kh7 maybe it doesn't win but there's nothing better left. 41...Nf5 42.e4?! The last chance was 42.R1d3 Nxe3 43.Rxe3 Bxe3 44.Kxe3 with the same rook endgame as in the abovementioned line. 42...Ne3 43.Rd6 Nxd1 44.Rxg6+ Kf7 45.Rxb6 Rh8 Now the draw is unavoidable. 26 September is a free day. The next round will be played tomorrow at 15.00 CET. 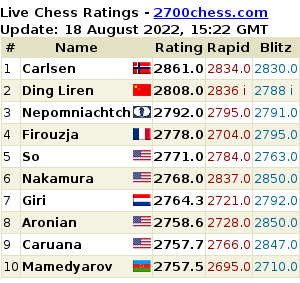 Caruana is half a point behind the leaders Gelfand and Ivanchuk. Grischuk loses them 1,5 points.